Awkwardly disagreeing with the status quo since 2008. ← Quick VT note: TLC for Stella’s transitioning toes. Vision therapy? Art therapy? Either way, we're winning. Currently, Stella’s only at-home vision therapy exercise is to wear the yoked prism goggles, base-down, for a minimum of 20-30 minutes per day. It’s going very well! The first couple days wearing them at home, she took them off after five minutes and I didn’t push her to do more. I figured she’d adjust, and she did. Voila! Less than a week later, 20 to 30 minutes (or even a bit more) are flying by and I don’t have to work so hard to keep her busy and entertained during goggle time. 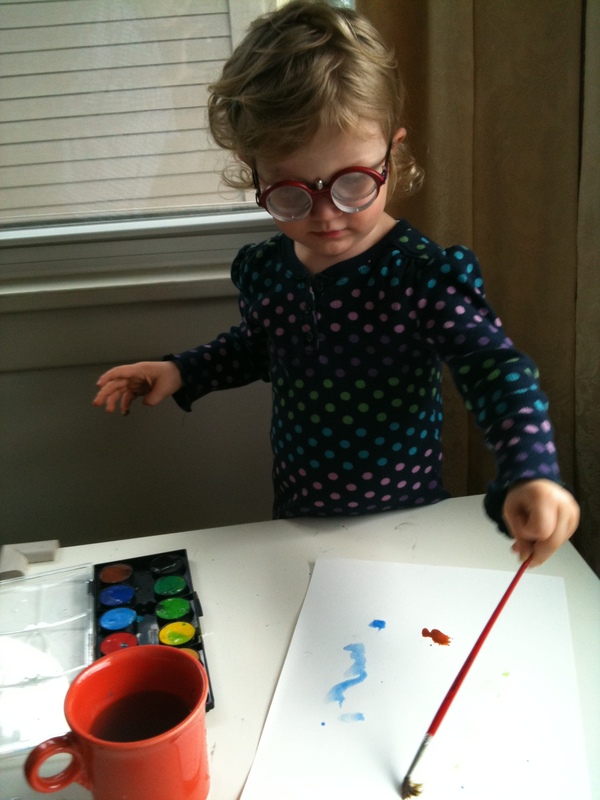 Plus, I could fill a gallery with her prism-goggle-influenced masterpieces! Naturally, I’m accepting bids starting at $500. GO! When asked about her inspiration, Stella said, "I made a nest for birdies!" Sure, it's a nest, but the underlying narrative taps into Americans' current longing for security and "re-connection" with nature. Brilliant work. Untitled. 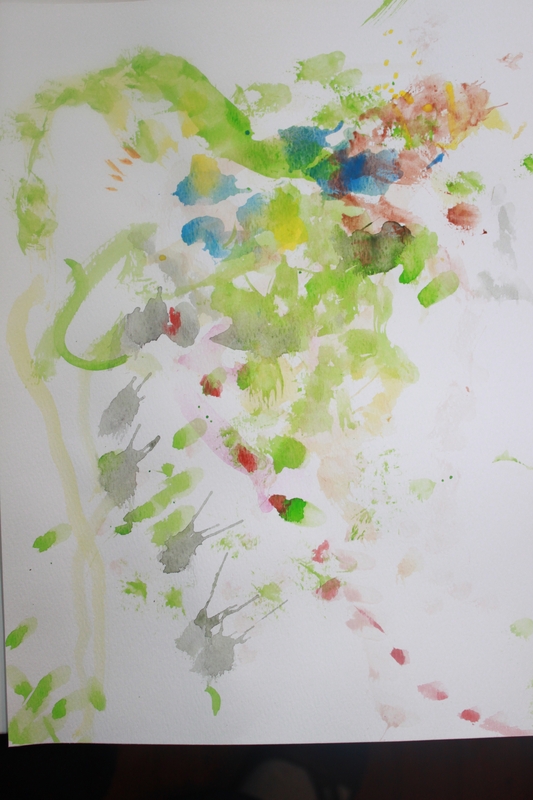 Stella's first foray into watercolors, on Easter Sunday. On the surface, it's a tribute to the joys of spring and candy, but underneath, there's a deeply conflicted expression of the promise and peril of modern childhood. Stunning. Mom, writer, worrier. And a stubborn idealist nonetheless. 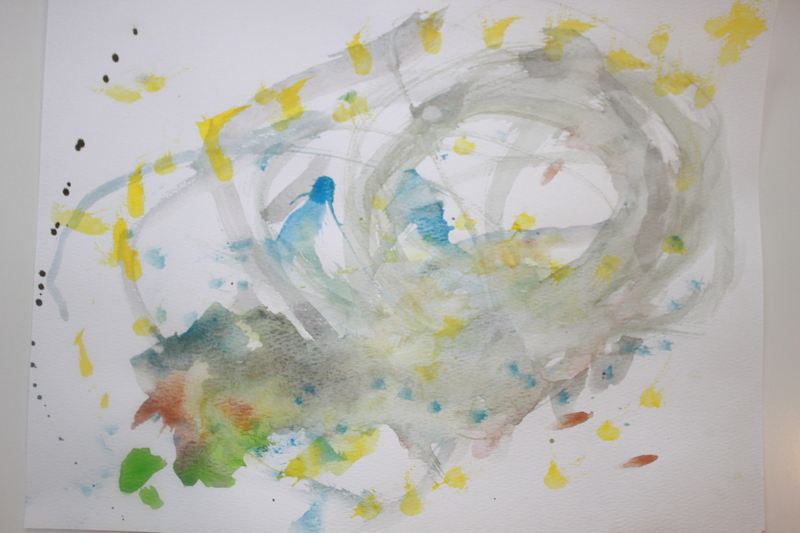 This entry was posted in Stella's eyes, toddler, vision therapy and tagged accommodative esotropia, amblyopia, strabismus, toddler, vision therapy, watercolors, yoked prism goggles. Bookmark the permalink. you are IN-sane. the copy accompanying the paintings had me rolling… took me back to when i worked on museum exhibition catalogues. HAH!!!!! i suggest a shadow-box frame and increasing the price. Hello I am new to the group Little Four Eyes. Through there, I found your blog and I am happy I did! I am curious about this vision therapy. Can you tell me more? Get the Life and Times delivered. If you're like me, and I know I am, you like having new blog posts emailed to you. How vision therapy is saving Stella's toes, and then some. Tracy on Goodbye, breastfeeding guilt.